Happy Spring! We’re almost there, people, I promise. I’m beginning this post with that statement since it recalls an entry I wrote last year about taking on a limited term appointment as Wilfrid Laurier University’s Government Information Librarian. It was a rather productive year as the GovInfo Librarian, and I loved my time in the job. Moving to Ontario gave me the opportunity to meet many colleagues in Canadian LIS who I would otherwise only get the briefest introductions to at national conferences. It also meant shifting “consortial cultures” as I moved from a CAUL province to an OCUL province and had to learn a brand new vocabulary of committee names and acronyms. And it also meant having to re-learn what “hot, hazy, and humid” means, let alone the value of central air. But I digress, it was a pretty good year. The past 12 months has been full of new colleagues and friends, introductions to new scholarly resources, publishing and speaking opportunities, and a chance to “make a difference” at the workplace. Sometimes, you leave the office later in the day than you intended, but you leave later because you really do enjoy your work. And that’s a good thing. My current nameplate is only an ODESI post-it, but we’ll fix that in time. Like February of 2012, February of 2013 was a month of changes, and March 2013 is a month of announcements. 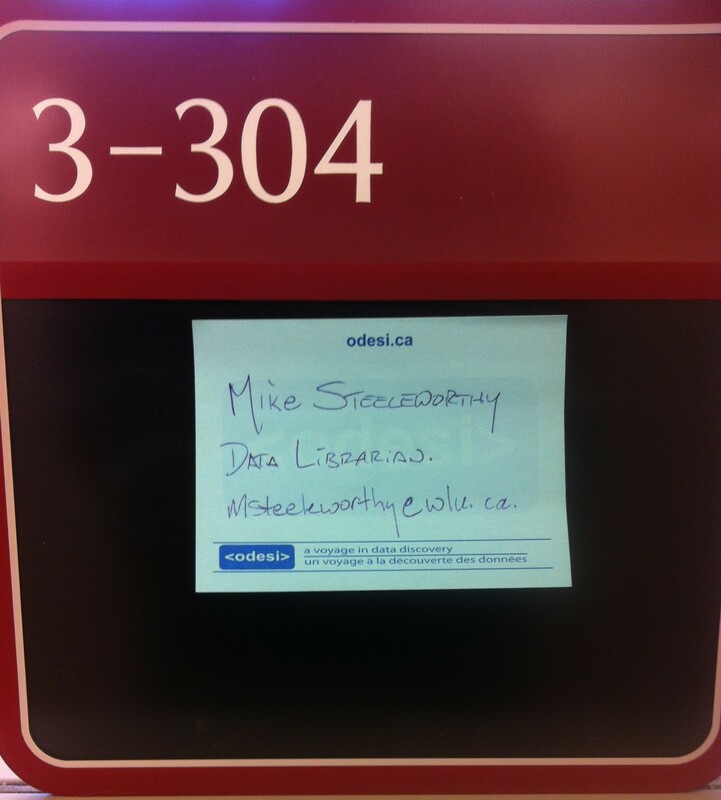 I’ve now accepted an appointment as the Laurier Library’s Data Librarian. Needless to say, I’m quite excited by this news and can’t wait to get the ball rolling. One of my main responsibilities in this portfolio is to help develop the Library’s research data management infrastructure and to facilitate research data access, usage, and collection on campus and in the communities we serve. There are some big steps involved, but my plan is to leverage the knowledge gained at CARL’s RDMI summit in January 2013 as we roll out services and resources to students, staff, and faculty on at Laurier. And also this one. When talking about living in Waterloo, ABBA will sooner or later be mentioned. Without fail..
Congrats on the new gig! Let me know the next time you’re in T.O. and we’ll have a celebratory drink. Thanks, Graham – will do! My first priority is to finish the move from the east coast to Ontario, but I’ll look you up (and everyone else) next time I’m in town.